It's a hard life for a "Vikings" woman. Especially when you're Lagertha (Katheryn Winnick), and you've finally managed to divorce your cheating ex-husband, get rid of your abusive second husband and at last lay claim as Earl to your village. Except of course, everyone is trying to take your power --including those who you trust most. That seems to be what incoming character Kalf (Ben Robson) is after, at least so far, in "Vikings" Season 3. Viewers were first introduced to the character in the season premiere, and he has quickly established himself as someone who has more under the surface than originally gleaned. 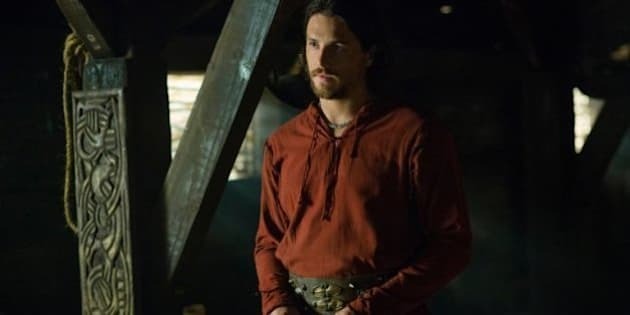 The Huffington Post Canada caught up with Robson to get his take on Kalf's true motives, learning to be a Viking and what it all means for Lagertha. HuffPost Canada: Should audiences trust Kalf? Ben Robson: I think you can trust him. To be Lagertha's second-in-command is a serious definition of trust, especially with her. It's such an incredible position for him. So I think he is very trusting. However, he's very ambitious; he wants to be known by the Gods. I think, especially in that time, it's all about acknowledgment from the Gods. To be recognized by them, you need to be in a position where you can have them see you in that light. So I think he is trusting, I just think he's ambitious. Why does he think his power move will pay off? He's very calculating and I think everything he's doing, he's fully aware of. I don't want to say he's somebody who's two steps ahead, but he definitely knows what he's trying to do and he's very smart. Even though people don't realize it, I think he's very intelligent in the way that he's approaching his stuff. Does he have a genuine love for Lagertha? Absolutely. I think especially with that close of a relationship, you have to love someone in terms of respect and looking out for one another. I think as second-in-command, for a period of time, he's looking out for her best interests. It's almost like being in a relationship without all of the craziness or the intimacy of it. Like having a relationship without having the benefits of being in a relationship, in a weird way. So I think there has to be a love, otherwise you wouldn't be able to do his job. He's a Viking, so should we assume he knows how to fight, too? That's a part of Viking culture. From the age of four or five, I think we've seen it with the children, they're already learning how to fight and the rest of it. So all of them have gotten to know how to learn how to fight, some of them better than others, obviously. Some are more calculating, some are smarter, more ambitious. I think it kind of goes hand-in-hand with being a Viking for sure. Whether some like to fight more or less than others is another thing, though. Did you have to learn some of these old-school languages for the role? Bits and pieces, yeah. I was quite lucky I didn't have to do too much. I mean I had to do Latin in school when I was young, which I absolutely hated. So in terms of having to learn these things, at least now I have something to do it for, but it's a challenge. It's all part of the character in the show; that's the beauty of acting, you get to learn all of these things and new worlds. So is there a limit to how far this guy will go to get what he wants? There's a limit for what he would throw himself in for. He has managed to do stuff without actually getting himself in trouble so far. So I think it's in the manner that he will do it. There's nothing he won't do in order to achieve his goals, but it has to be done in the right way. I really do think he has morals. When you've been in such a position, it's a case of, he has morals, and he knows how to look after people. "Vikings" continues Thursdays at 10 p.m. ET on History.